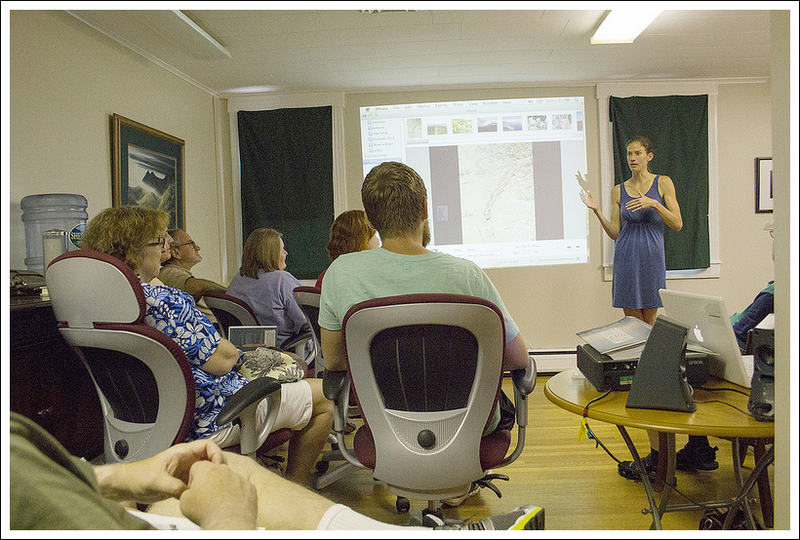 Jennifer Pharr Davis presents at the Appalachian Trail Conservancy Headquarters in Harpers Ferry, WV. Below: Virginia Trail Guide was honored to meet the family! 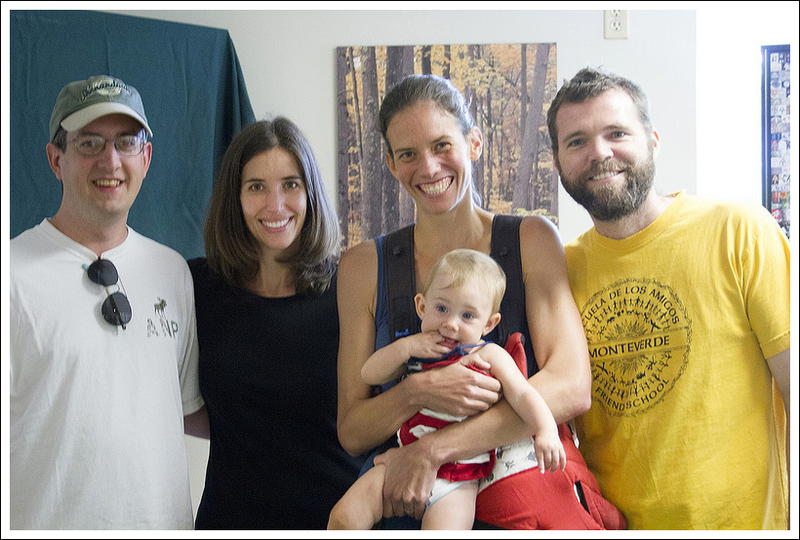 Back in July, we had the pleasure of meeting Jennifer Pharr Davis (and family) at the ATC Headquarters in Harpers Ferry, WV. She was there to talk about her hiking experiences and help promote her latest book, Called Again. Jennifer holds the record for the fastest hike of the Appalachian Trail, completing the 2150 miles in 46 days, 11 hours, and 20 minutes. Her husband, Brew was there to support her along the trail, meeting her to provide food, shelter, and love along the way. In 2012, National Geographic named her as one of the Adventurers of the Year for her amazing accomplishment. She also holds records for hiking the Long Trail in Vermont and Bibbulmun Track in Australia. During her presentation at the ATC Headquarters, Jennifer showed pictures of some of the places she has hiked around the world and talked about her experiences hiking the AT. We both left the talk truly inspired and I think a few minutes listening to Jennifer would have the same effect on anyone! In 2005, she established her company, Blue Ridge Hiking Company, with the mission of “making the wilderness accessible and enjoyable through written and spoken word, instruction and guiding.” She has authored three North Carolina hiking guides and two books about her experiences on the Appalachian Trail. Her husband also wrote a book about supporting her through the record-setting hike. You can purchase her books through her website. Jennifer was kind enough to do a brief Q&A with Virginia Trail Guide. Check out what she had to say! In Called Again, it was pretty clear that the New England states (especially New Hampshire) were tough on your body. I think most regular hikers have had days on the trail that aren’t fun, when everything hurts, when the weather turns, etc. What do you think about or do that gives you the strength to push through the pain/frustration and make it to your next goal? Live in the moment. You might not think you can make it to the top of the mountain… or to your car, but I bet you can take one more step and maybe even hike one more mile. Just take it one step and one mile at a time. It is WORTH it. I wouldn’t take back a single “BAD” day on the trail. Those are the days that strengthen my mind and my body the most. They give me the best stories for my books, Becoming Odyssa and Called Again. AND, the bad days give you a heightened appreciation for the good days. A bad day on the trail is still better than a good day in an office! We were made to spend time outdoors in motion. It is much more natural than spending all day in a chair. As I read Called Again, I was impressed by how much of the ‘traditional’ AT experience you were able to still have on your speed record hike. You witnessed beautiful sunrises/sunsets, saw wild animals, ate tons of food, shared time on the trail with an ever-changing cast of people and walked through a lot of weather. Do you have a favorite moment or memory from your most recent thru-hike that is unrelated to attaining the speed record? Making awesome trail friends. Two unexpected and unplanned thru-hikers came out to help us through the mid-Atlantic. I didn’t really know Rambler, and I had never met Dutch. But after a couple of days of hiking together, I now consider them to be two of the dearest men that I have ever met. I made so many awesome trail friends that summer! I think I appreciated the friendships even more that summer, because the encouragement, laughter and companionship was so helpful. I will never forget hiking up Blackstack Cliffs in the rain and mud listening to my friend Hampton recount all his dating blunders. I could hardly hike I was laughing so hard. In the beginning of Called Again, you shared some stories about hiking with your husband, Brew. I think a lot of couples who hike together read that section of the book while nodding and thinking ‘yes!’. There are always going to be different paces, changing moods and energy levels. What tips can you offer for communication methods to help maintain sanity and harmony for couples/groups that hike together? The trail really helps couples to focus on teamwork, communication and forgiveness. Usually Brew and I have it out the first week of hiking together. But after lots of talks, and plenty of forgiveness we are closer than ever for the rest of the trail. Remember that you are only as strong as your weakest link. If one person is miserable, you will both probably be miserable. Also, just because you are hiking together – you don’t always have to hike together. Consider splitting up for the morning or afternoon and meeting back up in time for the next meal. Finally, share the responsibilities of a thru-hike. I was an experienced thru-hiker when I met Brew, and it wasn’t til I started having him plan the trips, buy our resupply food, and select our camping spots that he really started to enjoy OUR hikes. Can you describe a little about what Blue Ridge Hiking Company does? We encourage everyone, especially women and kids, to GET OUTDOORS. We try to do that through writing, speaking, and guiding. I have authored two A.T. memoirs, and 3 N.C. hiking guides. Brew even wrote a book called 46 Days. We travel around so that I can give trail based talks at schools, businesses, outdoor stores, libraries, etc… And sometimes we offer very specific workshops for folks ready to take on the trail. Blue Ridge Hiking Company also offers guided hiking trips near Asheville, North Carolina. Right now, I have four contract guides who help me get folks out on the trails. Our most popular offerings are half and full day hikes, but we also lead custom overnight trips. On your Blue Ridge Hiking Company website, I read that one of your personal goals is to encourage more people to get outdoors, especially women and children. What are some easy and non-intimidating ways for people to get started with hiking or backpacking? I encourage people to start in their comfort zone. If you don’t want to go alone, then set out with a friend, pet, or protection. If you aren’t in great shape, don’t make your first outing a 10-mile ascent. If you enjoy the wilderness, you will want to go back to the wilderness. If you go back, your comfort zone will probably increase and you will be willing to try new and often more difficult hikes. I believe that when people experience and enjoy nature they are more likely to protect and preserve the wilderness. Our readers are mostly located in Virginia. Do you have a favorite place along the AT in Virginia that you remember or an interesting story that happened to you in Virginia? GRAYSON HIGHLANDS! It is really special. I love it there. I got to meet David Horton going up the Priest in 2005, and he has become one of my good friends, on and off the trail. Also, one day in the Shenandoah National Park, I GOT to see 14 bears. That was really cool. I always say, that if any state alone the A.T. has to have over 500 miles of trail then I am glad it is Virginia!